At my school there are officially 14 school days between now and winter break. There are numerous activities happening during those days. This week marks the Hour of Code, while holiday shoppe, winter concerts, and holiday parties will also be celebrated before winter break. We are limited in the number of hours and days that we spend with students helping them to learn. Educators often count down the days left in June, or now begin the countdown until Winter Break. While this time of year can be a difficult time to engage students and maintain their interest, it can also provide several opportunities to engage them in different ways than we normally would. I would encourage all educators to take advantage of the time still remaining, and challenge students up until the last minute. 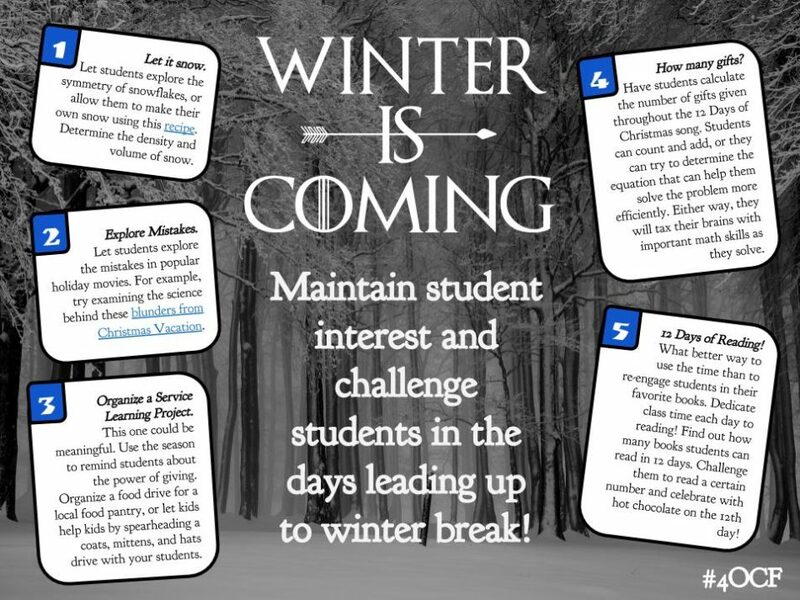 Try these activities to maintain student interest and challenge students in the days ahead, for Winter is Coming!